How is stacking hoops corporate development and learning? When people see my large pile of 68 hula-hoops they are generally excited or horrified. Often I hide them in the corner of the room – and decide while working with the team if I’m going to use them or not. Using your judgment is what makes you a team building facilitator. It does not matter what you call it! Team Building is not an activity. It is part of the corporate development & training. As long as you treat it as an ‘activity’ it will be a silly game that you had us play. If you treat this as an opportunity to connect the content (whatever it is) to an actual behavior change & how we get work done – you will be seen as a person who adds great value to the organization and made the training connect in the heads of the participants. How is stacking hoops corporate development & learning? Team Building. 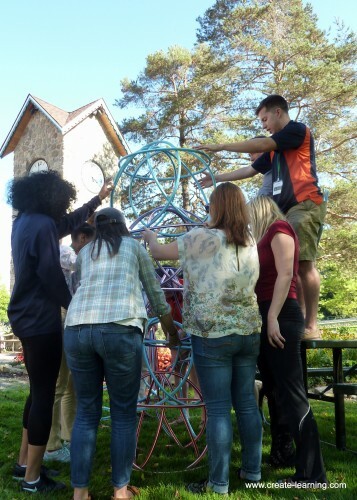 The team is asked to build the tallest tower replicating a 6 hoop structure, that I built for them. This illustrates how each person is a part and the team needs each other to stand. Creative use of existing resources. 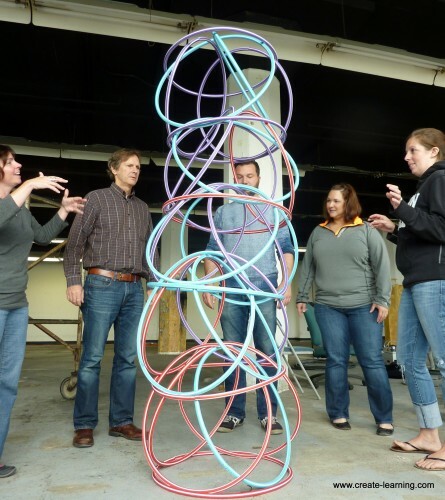 The team is asked to use the hoops to build a free standing tower 6 feet tall. No example or sample is shown. This illustrates paradigms of thinking and how easily we can get stuck. After about 10 minutes I show them an example with 6 hoops. Usually, the team can then build much higher, illustrating how 1 idea or slight suggestion may move the team forward. Organization Design. Following or during a workshop on complexity and organization design the team works to build the tower as high as possible. This illustrates the need for solid levels-or-work and organizational support in all directions. Managerial-Leadership & Coaching. The team will identify 1 person to operate as ‘team coach’. This person is shown an image of the 6 hoop structure and a multilevel tower. They are asked to coach, without touching the hoops, the team through the build. Illustrating the challenge of seeing a completed diagram and working coaching a team to complete the task. How is this like work? 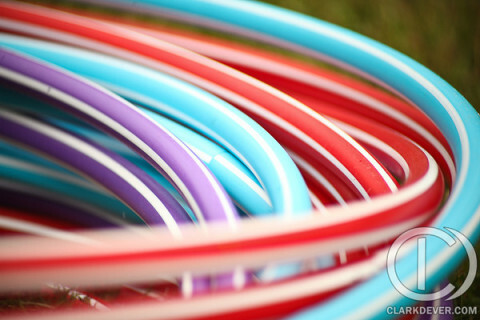 People have an idea of a hula-hoop and its utility until they have been exposed to another use. This may be enough to break the psychological inertia (stuckness). At work, we develop ideas of the utility for resources and interactions until we’ve been exposed to another way of understanding and interacting with those people or resources. By having people do something different, that appears to be novel or unique may be a sufficient change to break their stuckness in thinking or the existing patterns of behavior.